What-If 0129: "Black Hole Moon"
Overload_ed wrote: I want to know how the change in size would have affected asteroids that formerly would have hit the moon? I know the moon protects us from many hits. 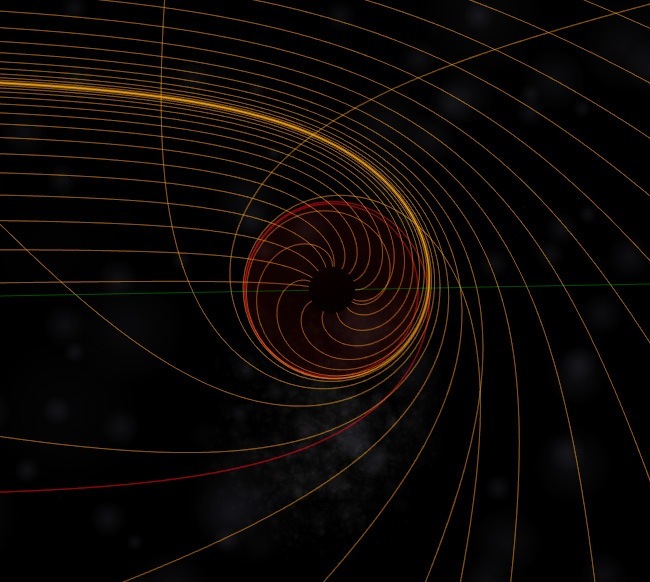 What would happen if an asteroid were to contact the moon black hole? It depends on the size of the asteroid. Smaller asteroids passing close to the black hole moon will be torn apart by tidal forces and form a ring, then an accretion disk. The larger the asteroid, the closer it will have to come to the event horizon to be torn apart; otherwise it will be flung off in another direction. Assuming that asteroids can approach from any direction, this neither increases or decreases the chance of it hitting the Earth. However, since the distance at which tidal forces would rip an asteroid apart is much lower than the current radius of the moon, most trajectories which would have formerly impacted the lunar surface would instead pass by, thus having a greater chance of hitting Earth. Nope, smaller asteroids will have to approach closer to be torn apart. With small asteroids, almost all of the force holding them together is from the strength of the rock. With Big asteroids, Gravity becomes the main force holding them together, and they get torn apart once they enter the roche sphere. Also, larger size means stronger tidal forces. treptoplax wrote: It's quite possible this could solve the energy crisis; just build a tiny Dyson sphere (!) around it and dump matter in, then beam the energy back to earth. I'd say that depends on the difficulty in creating a convenient black hole. Assuming that the moon magically turned into a black hole in the first place. I'm still not sure it would be worth it. Looking at this http://physics.ucsd.edu/do-the-math/201 ... olar-power it seems like any space based power delivery is only a couple of times better than solar. So just make more solar. Whizbang wrote: What happens when you point a laser pointer at the moon? Because you're not pointing accurately, or because the beam would fan out so much that no photons would actually hit the event horizon? Surely some eventually would? I was hoping that someone observing the earth from beyond the moon could have a total eclipse of the laser pointer. If you consider the diffraction/diffusion of the laser beam through the atmosphere, you certainly won't have a total eclipse. This is because if any photon trajectory doesn't end up in the event horizon (i.e. the Swarzschild radius for static black holes), there are infinitely many trajectories that end up in your observatory. If you shine the laser from orbit, the laser surely needs to have a diameter smaller than the diameter of the event horizon. But for a total eclipse, you also need to know how much scattering happens due to (virtual) particles in the vacuum. And there was something about interference between the photons? I recall there was some discussion about this earlier, but I can't remember what could lead to the beam diffusion in a "perfect" vacuum. If you shine the laser from orbit, the laser surely needs to have a diameter smaller than the diameter of the event horizon. For a total eclipse of the laser pointer, your laboratory would of course have to be fairly close to the black hole. And quite small. Yes, the normal moon can eclipse the sun, because any ray that is curved towards the observer strikes the moon (and therefor doesn't hit you). The black hole moon, however, has a region near the event horizon where the light trajectory can turn* by any amount, be it 1° or 1000 revolutions. So instead of seeing the sun/laser pointer where you would expect, you'll see it somewhere around the event horizon. *Of course the light doesn't turn, but black holes are the best space benders and make it seem, to our feeble minds, that the light follows a curved path. There should be some far-future sequel to the Avatar: The Last Airbender universe where futuristic benders observe black holes and learn spacetimebending from them. Someone should suggest the idea to Peter F. Hamilton - it's his sort of thing. Is that pretty much what The Dreaming Void and the Evolutionary Void was all about? Whizbang wrote: Is that pretty much what The Dreaming Void and the Evolutionary Void was all about? I don't really know, having never seen Avatar, but I think so. In a different way the Night's Dawn trilogy is also about this (+zombies, + for some inexplicable reason Al Capone). Hamilton certainly has a "theme" to his books (I'm not complaining, because it's a fun theme, but it's definitely there). FredTheRanger wrote: Would someone please explain to me why, in Figure 3, he seems to be saying that the Moon repels the Earth? That's just your misunderstanding. Earth and moon have a common center, and they are both rotating around that center. It's like a http://en.wikipedia.org/wiki/Mobile_(sculpture), everything needs to be balanced. Now now, according to one source, the laser pointer's sky-circle would have a diameter of about half the usual full moon's (or a fourth the area), so if you knew where the moon was, it wouldn't be that hard to get the point-sized moon with your fourth-degree-wide circle of laser pointer. Of course, you would probably miss for not having any idea where the moon was. Not like it's going to likely eclipse any stars you might otherwise see. Could we put a space telescope in a tight orbit around the black hole in order to use it for better observations through gravitational lensing of some kind? sevenperforce wrote: Could we put a space telescope in a tight orbit around the black hole in order to use it for better observations through gravitational lensing of some kind? As far as my inderstanding of this lensing goes: no. All the "reflections" near the event horizon are condensed (and darker/redshifted) copies of the whole view around you and there's a part of your view simply black, so there's no point where you can get a positive magnification. I can't imagine that's quite right, not when gravitational lensing allows us to see more distant galaxies than we would otherwise be able to see. A supermassive black hole has an event horizon larger than a telescope. A moon-mass black hole has an event horizon smaller than a telescope. I'm no expert, but wouldn't there be a large effect on the ecosystem? Surely many animals (and perhaps even plants?) depend on moonlight and the lack thereof would dramatically influence their behavior. Raucousbeard wrote: I'm no expert, but wouldn't there be a large effect on the ecosystem? Well, it would make werewolves indistinguishable from ordinary humans. This sentence seems odd: "When you're floating outside a spherical mass, its pull on you is the same regardless of whether the mass is concentrated at the center of the sphere or spread out throughout it"
Don't we measure differences in gravity's pull on our Earth sphere? I get it intuitevly that with greater distance the difference is less noticeable. So how to calculate the distance at which it doesn't matter? FuzzyDunlop wrote: This sentence seems odd: "When you're floating outside a spherical mass, its pull on you is the same regardless of whether the mass is concentrated at the center of the sphere or spread out throughout it"
That's the thing, though, the earth is not a sphere. It bulges a bit at the Equator, and of course there is terrain. In addition, if you're on the earth's surface, there is the centrifugal force from spinning once every 24 hours, felt most at the equator and not at all at the poles. These effects are small, but not zero. Also, this theorem requires that the mass distribution be uniform, or at least symmetric. Any large deposits of heavy or light elements somewhere inside the earth would make it asymmetric. Again, the effect is very small. The Earth isn't a sphere, that's why. The Earth is an oblate spheroid, and its mass is unevenly distributed. Theoretically, a uniformly-spherical mass will be completely subject to the shell theorem and therefore exert the same exact pull on you regardless of whether the density gradient from the surface to the centre is constant or not. But the Earth's density is not spherically symmetric at all; the overall shape deviates from a sphere by a measurable proportion, and the local density of the crust varies considerably. Thus, the local gravity will vary slightly from place to place. The gravity of a uniform spherical shell only depends on its center and its total mass for anything outside the shell. For anything inside the shell, the net gravity of the shell is zero.